One of my favourite things about winter in Queensland is the abundance of fresh delicious strawberries. An impromptu invitation for family to come over for dinner left me wondering what quick recipe I could whip up that would take advantage of these without disguising them too much with other flavours. This recipe is fast to make, especially if you have the dough pre-prepared. It’s just a matter of macerating the fruit and baking. While strawberries and rhubarb are a classic combination you could easily substitute with other berries or stone fruits such as plums and nectarines. 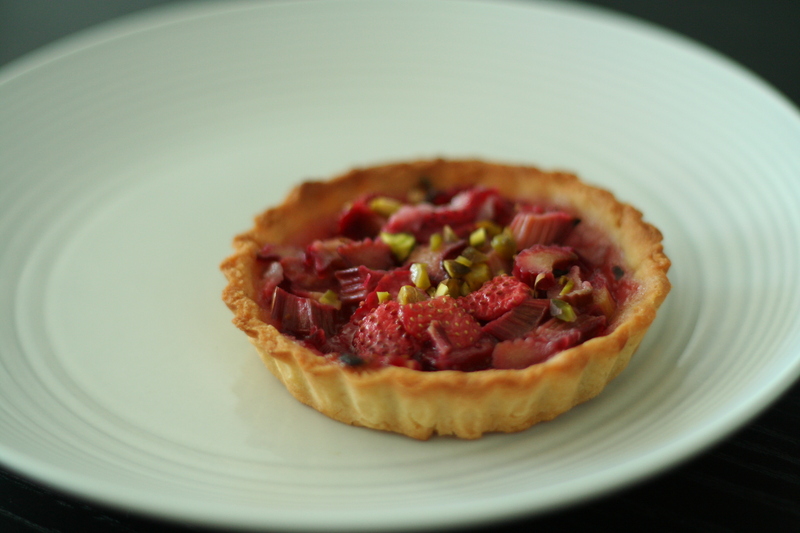 The pistachios on top give colour and an added crunch but can be left out if you’d prefer. This recipe makes 6 10cm tartlettes. You will only need about 1/3 of the amount of dough but this can be halved or the excess can be stored in the fridge or freezer for later use. Beat the butter in a mixer until smooth and creamy. Add the caster sugar, almond meal, salt, vanilla and eggs and mix until combined, scraping down the sides of the bowl as necessary. Add the flour half a cup at a time, mixing on a low speed until the dough comes together. It should be quite soft. Roll the dough together with your hands and wrap in cling film and place in the fridge for at least an hour. The longer it cools the easier it will be to handle. The dough can be kept in the fridge for up to 2 days or frozen for up to 1 month. When ready to make the tartlettes, break off a piece of dough and place the rest back in the fridge. Roll the dough out to approximately a 0.5cm thickness. You can make the dough thicker or thinner depending on your preference but cooking times should be adjusted accordingly. I like to roll my dough out on a piece of baking paper to avoid sticking to the bench and you can dust with some flour if the dough is hard to handle. Fit the dough into your tartlette tins (I like to sit my tin upturned on the dough then flip it all over with the baking paper) and lightly press in. If you have any gaps or cracks use the scrap pieces of dough to fill them. Prick the bases with a fork. Refrigerate for at least 10 minutes. 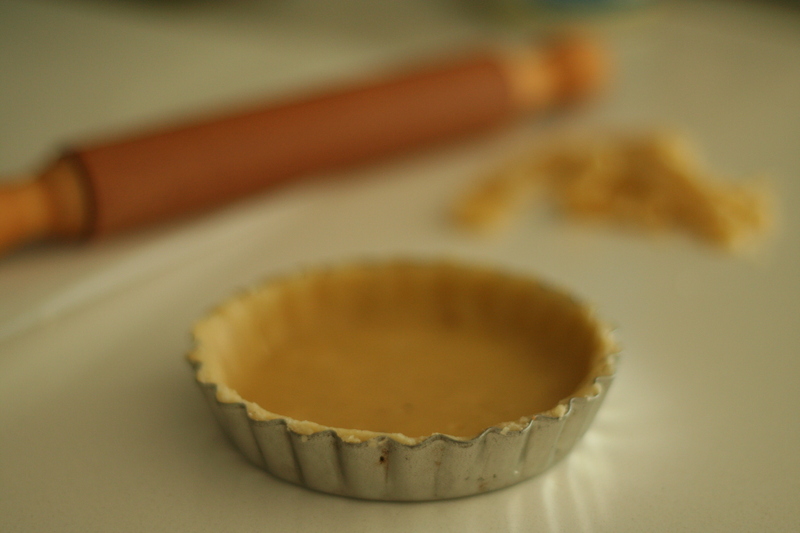 Preheat your oven to 180° and blind bake your tartlette cases for 10 minutes or until lightly golden. You can weigh the dough down with weights or beans if you like but I found it wasn’t necessary. Allow to cool before adding the filling. Combine the strawberries, rhubarb, sugar, cornstarch and lemon in a bowl. Stir to mix. Allow to sit for 10 minutes. 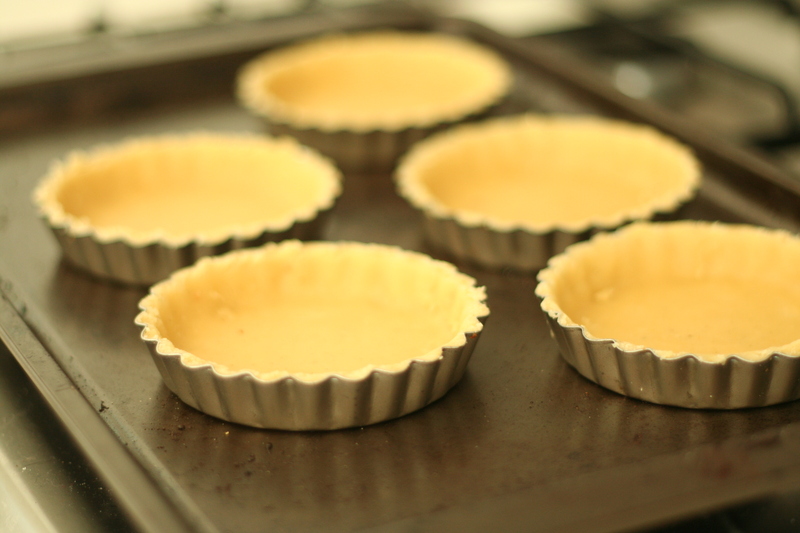 Spoon the filling into the prepared tart shells but don’t overfill them. 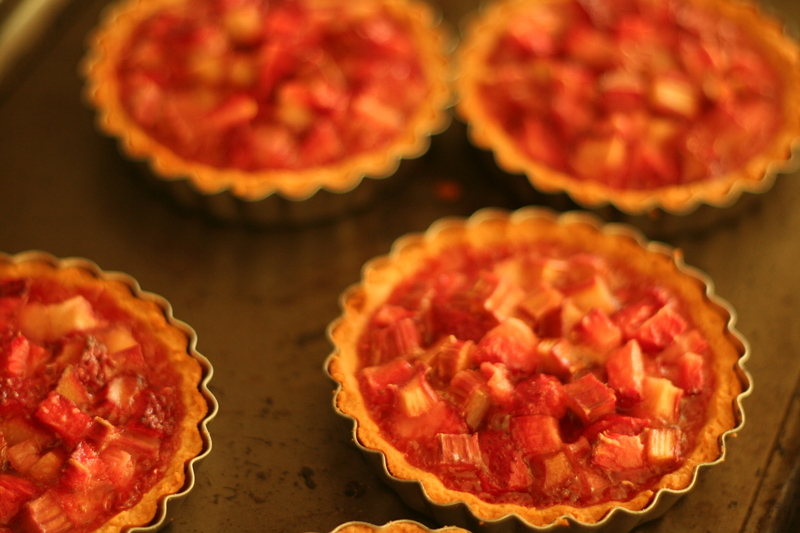 Add a spoonful of the juices from the fruit to each tartlette. Bake for 25-30 minutes or until the filling is no longer runny. Allow to fully cool before removing the tartlette cases. 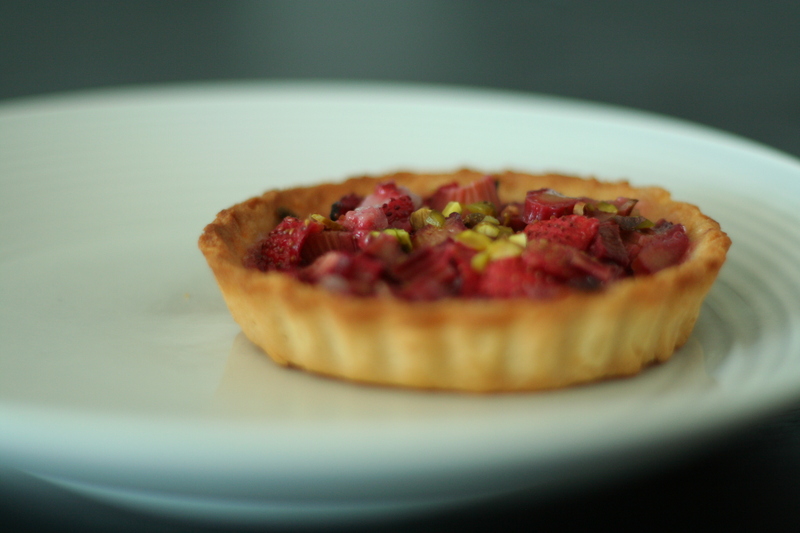 Top with extra diced strawberries and chopped pistachios. Serve with dollop cream or ice cream.